As the executive’s right hand, the executive assistant is expected to handle responsibilities of all sorts, including standing in for the executive him or herself. Check out our executive assistant resume sample and writing tips to craft an excellent resume that showcases your capabilities to their fullest extent. Or, if you are short on time, try out our easy-to-use resume builder to create one in minutes. Below are two examples of an executive assistant resume; one with a professional profile, and one with a summary of qualifications. Check out our qualifications summary guide to figure out which one suits you best. Looking for a different job or career? Take a look at our entire resume sample collection. 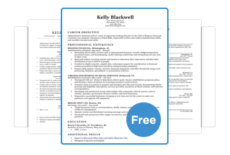 If you like the resume, but not the template, you can find another in our database of free-to-download resume templates. Ready to move on to your cover letter? Peruse our expansive cover letter collections for pointers on how to optimize yours. Experienced and quickly learn office basics, including printers, fax machines, scanners, etc. As an executive assistant (EA for short), you might want to simply compose your own resume, and we think you should. Keep reading for the advice professionals use when crafting an executive assistant resume. Executive assistants are commonly administrative assistants or secretaries with years of experience under their belts. As such, it’s important to display both skills and professional experience. The best resume format for displaying skills and certifications as well as education is our Combination Resume Format. The Combination Format ensures that equal attention can be given to the two equally important parts of your resume – your skills / certifications and your professional experience. Why are these two parts so important, and why not one over the other? Well, your professional experience section is critical for positions that demand years and years of time spent under certain conditions. For example, if you were applying for a management position at a restaurant, they might not care so much that you have a certification from a bar-tending college. On the other hand, they do want to see you’ve managed other busy and popular restaurants, and the only way to show that is to display your experience. However, some positions demand more technical knowledge. If you are a plumber, experience is important, sure, but if you plan on working around the country on large projects, having 10 years experience at Mom & Plumbing Co. might not be enough. You would do better to emphasize your CPD certification from the American Society of Plumbing Engineers (ASPE) or any other certifications or specific accomplishments you may have gathered over the years. Specific office skills are highly valued, both in terms of catching the eye of those executives and as a means of ensuring your efficiency. An executive assistant, however, needs both experience and skills. Working in an office with high powered executives takes a tremendous amount of finesse and patience that only experience can provide. However, specific office skills are highly valued, both in terms of catching the eye of those executives and as a means of ensuring your efficiency. Therefore, use the Combination Resume Format for your best chance at landing one of these sought after jobs. To be a top-notch executive assistant, you will need to have a few technical skills under your belt, as well as a number of soft skills that are critical in a high-powered office environment. This should be a no-brainer, and is required of any office worker. At the very least, administrative and executive assistants should know MS Office Suite. This includes how the Windows operating system functions, especially how to locate files. Furthermore, MS Word, Excel, and PowerPoint (and perhaps Outlook and Publisher) will be used frequently. Still, the MS Suite isn’t the only name in the game anymore. Cloud storage systems, like Dropbox and Google Drive, are more and more common in an office setting. Google Drive, furthermore, has its own suite of free-to-use office software, meaning you might be juggling documents between Microsoft and Google systems. Finally, you might want to have knowledge of communications software like Skype and email clients, as well as scheduling software. If you are assisting in an office, you need to know how to login to and operate the computers in the office, as well as use the phone – especially transferring calls to and from different lines. Furthermore, you need to be the resident expert with any copy machines, scanners, fax machines, etc. And when these break down (and they all will), you also need to be able to call the appropriate service to have them fixed. Also, office supplies will be your greatest commodity, so being able to manage, ration, and keep track of otherwise mundane items like staplers and Post-It Note books will be imperative to your job. Obviously, you might not be 100 percent familiar with everything on day one – every office is different after all. Still, having used these items in the past, even if they are different models, will greatly assist in your executive assistant job search. Fundamental to being an EA is communication. A large portion of your massive amount of communication will be written, especially through email. Therefore, your writing skills, especially formal letter writing, need to be top notch. Many executive assistants are sticklers about grammar and minor details, and this proclivity shows in their professional-sounding work. Office supplies will be your greatest commodity, so being able to manage, ration, and keep track of otherwise mundane items like staplers and Post-It Note books will be imperative to your job. Because of the amount of time spent writing emails, messages, memos, and other notes, your typing speed needs to be fast. Most EAs type faster than 55 WPM, but the best get close to 70. There are a ton of great sites that can help you brush up on your typing skills for free – be sure to get some practice in and test yourself; this is one of those easily quantifiable skills you can use to buff up your resume. Another important tool executive assistants need to master is CRMs or Customer Relationship Management Systems. These systems keep records on customers and allow companies to referrence past communications and sales in order to better serve both return and new clients. Most executives requrie their EAs to be familiar with these systems, but there are more than a few, so familiarity with one is generally sufficient. Your writing skills, especially formal letter writing, need to be top notch. Many executive assistants are sticklers about grammar and minor details, and this proclivity shows in their work. The most popular CRM system is Salesforce CRM System, and as such it is a good place to start when familiarizing yourself with this technology. In the combination format, we place skills before professional experience, but that doesn’t mean that your work history isn’t just as important. You just can’t put two sections next to each other (or you get one of those weird over-designed resumes that are mostly a waste of time and just gimmicky). Professional experience is very important, especially if you want to be an executive assistant. It is not an entry-level job, so you will need to either have previous experience in this position, or have accumulated enough experience in other jobs that it’s roughly equivalent. Tip: Most executive assistants start as administrative assistants or secretaries, and are often hired for an EA position in the company they’re currently working for. Most EAs who are hired externally have specific executive assistant experience.